An increasing number of consumers are bypassing traditional customer service mediums (i.e. phone, email) and opting for channels like Twitter and live chat due to the faster, more personal nature of the communication. While successes on these mediums can mean lots of attention via positive tweets and posts, it can also mean a big committment for your company. At OpenSesame, we provide a live help option on our site for customers looking to get more information, submit a problem or connect for help. We’ve found our live chat option to be very useful for bringing in new customers and responding to support issues quickly. If you are considering adding live chat as an option for your company, here are some pros and cons to help you weigh the decision. With the creation of Twitter and the expansion of sophisticated search engines, people are becoming used to instant answers to problems. Live chat provides a quick way to connect with your customers who want immediate answers or dislike using the phone. Even if you are unable to immediately fix your customers’ problems, they will appreciate their concerns being heard and increase the chances they will enjoy working with you. Zappos is known for having customer service agents who are empowered to address all of the customers’ concerns and encouraged to create personal connections with those who call. Many repeat customers proudly claim they always buy from Zappos, even when their prices are higher, because of how much they appreciate the above and beyond customer service. 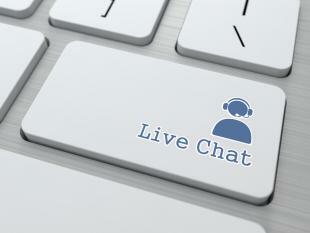 Live chat can enable company to be personal and accessible, by having real-time conversations with customers. Furthermore, being easily available to your customers is a great way to be more transparent. The personal tone and easy of use that live chat gives your company can go a long way to make your company likable. Having live chat available, especially for small questions, leaves other forms of customer service, such as phone and email, open for larger problems. People will be less likely to call or email about small questions and concerns if they have live chat as another outlet. This can greatly reduce the amount of time you have to spend on the phone and on emails. Additionally, live chat is an adaptation to the digital world which means many of your customers, especially younger customers, will feel more comfortable and familiar with live chat than other sources of communication. It can be very difficult to convey emotions and tone over chat. Currently the only solution is to use emoticons, which are taboo in the professional world. You have to be careful with your phrasing to ensure your words are not misinterpreted. For this reason, it is best to choose one of your friendliest and most self-aware employees to answer your chats. We no longer live in a world where customers live nearby or work on a 9- to 5- schedule. As a result, it is often not enough to be available during those hours only. Try to split up the duty of answering live chats to cover as much of the day as possible. At OpenSesame, we have someone available from 6:00am to 6:00pm PST every day. When someone is not available, the chat notifies us via email so the concern can be addressed as soon as someone is in the office and ready to respond. The goal of live chat is to give your potential or current customers immediate answers to their questions; therefore, it is important answering chats is always your highest priority. For example, at OpenSesame we have a dedicated staff member in charge of customer service who makes it her personal goal to answer each live chat within six seconds. This means she is always willing to drop everything else to answer the chat. Depending on the number of chats you receive, being on chat can make it diffcult to completely immerse yourself in other tasks for long periods of time. To balance this, other OpenSesame employees manage our live chat at certain times of day so our customer service manager can focus on some of the bigger customer concerns. Implementing a live chat initiative on your site has a lot of benefits, but you need to be sure to plan ahead. Determine what hours and days your chat option will be available based on customer needs. Set expectations with live chat staff on scheduling and response time. Outline a process for how issues are communicated to the support team to address if additional help is needed. Train your live chat employees on customer service best practices AND online communication techniques. Any pros or cons I missed? Share them in the comments!